Many conservation practices are available for animal agriculture producers interested in protecting air and water quality, improving soil health or wildlife habitat, and increasing the productivity of animals, pastures, and crops. This module will especially focus on conservation practices impacting water quality with the goal of keeping clean water clean. Farmers and ranchers can implement conservation practices on their own. They can also seek technical or financial assistance through agencies such as a local Conservation District or USDA Natural Resources Conservation Service (NRCS). NRCS has developed approximately 160 conservation practice standards at the national level. States have the option of adopting a standard and using the same or more stringent criteria. Farmers should use state-adopted standards whenever available. To find out whether your state has adopted a certain standard, contact your local NRCS office. Conservation practices relevant to water quality and animal agriculture can be divided into three categories. Clicking the link will take you to a virtual tour website that describes each practice and includes several photos. Conservation practices should be implemented on an individual farm basis to ensure they are addressing a natural resource concern and will be effective in the particular farm setting. Is the farm a confinement facility or are animals on pasture (or both)? Are confined animals kept under a roof or open lots (or both)? Where are pastured animals housed or fed in the winter? Does the operation include crop land? Are there waterbodies such as streams or ponds on the facility or crop land? How does the farm store or handle manure; as a solid or slurry/liquid? How much manure does the farm produce and where is it currently stored? Are there neighbors nearby? How many and where? Are there environmentally sensitive features on or near the facility? Wells, sinkholes, public parks or public use areas, wildlife, impaired waterbody, or similar features should all be considered. What are the goals of the farmer or rancher? What is important to them and what do they have interest and capacity to implement and manage? For example, consider these fictional farms. Both have 200 dairy cows and are interested in developing a manure management system. They are both in the same state with similar soil types. Farm 1: There is a child in college interested in returning to help manage the farm, so future expansion is a strong possibility. 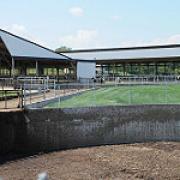 The farm has sufficient cropland to use the manure they currently produce as crop fertilizer. Farm 2: This farm is considering organic production. They do not have much cropland and must export most of their manure to neighboring crop farmers. This farm also has connections to organic crop farmers as well as the nursery and landscape industry. While both farms have similar characteristics, they have very different goals. Their conservation plans could be very different. Farm 1 is likely to consider an earthen or concrete slurry manure storage structure with the biggest question being how large to make the structure considering a possible expansion in the near future. They are likely to develop a comprehensive nutrient management plan (CNMP) to ensure the cropland base continues to support any future expansion. 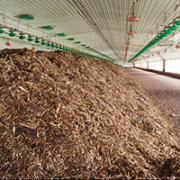 Farm 2 may look at manure collection and storage very differently. 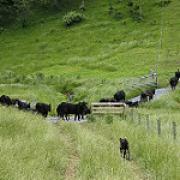 The cattle may have access to open lots (manure is handled as a solid) or grazing paddocks. Given the off-farm connections and lack of crop land, composting or other ways to generate value-added products may be an option. Marketing manure or exporting it off-farm will be important to this farm’s manure management plans. Both farms intend to protect natural resources but need to implement different practices to reach their goals. These materials were developed by the Livestock and Poultry Environmental Learning Center (LPELC) with funding from the USDA.Natural Resources Conservation Service through an interagency agreement with the U.S. Environmental Protection Agency. All images on this page, unless otherwise noted, are courtesy of the U.S. Department of Agriculture or USDA NRCS. For questions on this material, contact Jill Heemstra, jheemstra@unl.edu.